Cook on a rock when you are camping! This is an unusual method for outdoor campfire cooking. A rock can be used as a cooking surface for your camp mealtime. 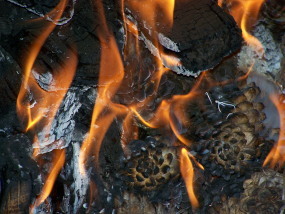 The heat is conducted through a rock from coals or fire below. This is a great method when hiking and you don't have room for a skillet or pan. Pick your special rock carefully. Look around for a rock that is flat and less than 2 inches thick. Give it a quick wash or brush off any dirt. Make a fire that is key-hole shaped. Place the clean rock over the square part of the keyhole. Then put hot coals under it. Heat the rock slowly. If one side heads too fast and expands more quickly than the other side, the rock may break. Turn the rock over, allowing it to heat on each side gradually and as evenly as possible. When the rock is finally hot, use it as a grill by placing it directly over the coals. Place your food directly on the rock to cook it; you may want to cover the cooking surface with foil. When the upper surface cools, turn the rock over, brush it off, and cook on the hot side. If you have found a very thin rock, the heat will conduct through it and the rock won’t need to be turned. It may take some time to cook your food thoroughly. Be persistent. It's worth the wait. Then, enjoy! Tell us your cooking on a rock experience.